Over the past 8 months Ridango R&D has worked heavy to launch new self-service door validator that features both NFC communication and 2D reader for QR, aztec, barcode tickets. Ridango has released its second version of the self-service validator DV12T. The new validator is DV15S. The self-service validator DV15S is a contactless smart card reader intended for fast ticket validation and contactless payments onboard of vehicles. The reader is compatible with MIFARE Classic, MIFARE Ultralight, MIFARE Desfire and supports EMV contactless and NFC communication (including both passive reader mode and an active peer to peer mode communication with the handheld ticket validator (T12T). DV15S optionally includes 2D barcode reader for reading ticket information either from printed paper ticket or on mobile phone screen tickets (e.g. QR, Aztec, Barcode etc). The reader is housed in a strong plastic case supposed to be fitted around a pole or on a wall. The reader communicates over a CAN bus interface with the ticketing system controller or a communication hub and thereto directly with back-office system for live account based ticketing. The reader display is FSTN black-white graphical LCD that is with with backlight and sunlight readable. The door validator features also 4 touch sensitive buttons for zone selection or friend ticket purchases, a magnetic buzzer and has been built rugged for transit environment with high working temperatures. 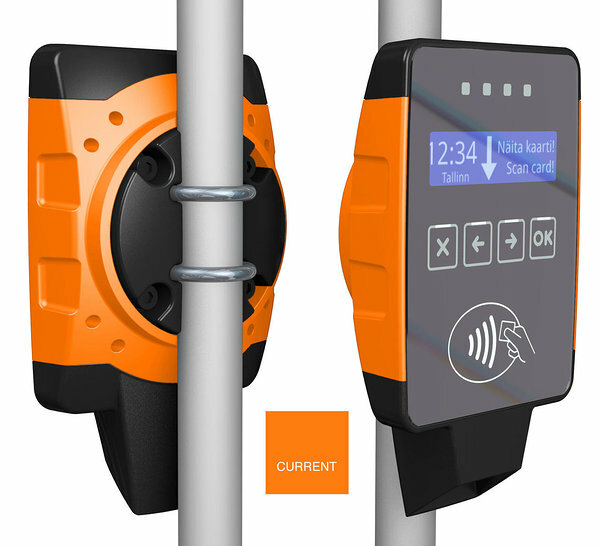 The self-service validator comes initially in three different colors - orange, khaki blue and brown. Ridango's new self-service validators will be launches firstly in Sweden in August and September 2015.